June 11, 1997 - Salzburg, Austria. 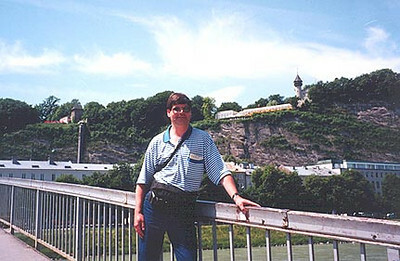 I'm standing on Makartsteg, a pedestrian bridge over the Salzach river. In the background on the hilltop; to my right, Bürgerwehr, from where the previous photo was taken, and to my left, Cafe Winkler. An elevator that runs within the vertical rock face can be taken to reach this cafe, otherwise you are looking at a bit of a walk from either side of Mönchsberg. The old part of Salzburg is located on the far side of this bridge. Directly ahead of me, you'll find Mirabellgarten, pictured in the next photo.